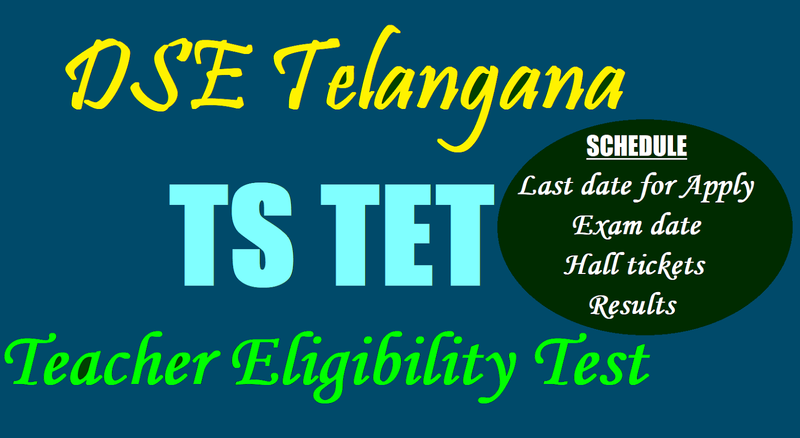 TSTET notification, Information Bulletin download date, Fee payment, online application submission, Hall Tickets, Exam date, Results dates are announced: The Director SCERT and Ex-Officio Director TS TET Cell has announced the TS TET 2019 Exam Date along with Schedule on 12/6/2019 for conducting the TS Teacher Eligibility Test in Telangana State through Rc,No.61 and guidelines and instructions have been issued for Pre- examination work of First Teachers Eligibility Test and identification of centres. The first TS-Teachers Eligibility Test scheduled to be held on 23-07.2019. TS TET Exam date: ..
3. Online submission of application through http://tstet.cgg.gov.in:..
#TSTET to be held on ..
TS TET Cell has informed to all the District Educational Officers that, they shall be the in-charge for conduct of Teachers Eligibility Test under the overall supervision of the District Collector and TS TET Cell has requested to the Educational Officers in the State to submit the list of identified examination centres through ONLINE TRACKING SYSTEM provided to the District Educational Officers duly obtaining the undertaking from the identified Schools / Colleges of the managements. They are also requested to identify 10% extra centres in the matter. The guidelines for identification of examination centres district wise and estimated number of candidates has been issued in this regarding. The District Educational Officers in the State to give wide publicity in the local press media about the schedule of TSTET- 2019.
a. Any Central Government / State Government / Local Body / Private recognized High School / Junior college / Degree College / P.G. College / COE/ D.Ed. College / Engineering College / Polytechnic / ITI Etc., can be identified for constituting an Examination Centres for first TS-TET-2019. b. Each centre identified with good accommodation and furniture (suitable to teacher candidate) is supposed to have a capacity of minimum 200, Optimum 240 and maximum 300 for allotment of candidates. c. The centres will be identified in the district head quarters only. d. In case of Rangareddy district centres may be constituted with in the area of Greater Hyderabad Municipal Corporation. e. If an institution has good accommodation and furniture, multiple centres up to a limit of 4 centres in that institution can be constituted, and can be designated as A Centre, B Centre, C Centre and D Centre of same address with separate centre numbers. f. The centre identified should be nearer to the storage point of confidential material i.e., District Treasury Office / Police Station. g. Institutions with compound wall and gate shall only be identified for constitution of examination centres. h. In each room / hall, 16 or 24 candidates shall only be accommodated and in any room / hall not more than 24 candidates shall be accommodated. If there is a big hall that can be split up into multiple rooms of 24/16 as the case may be. i. Each room shall have sufficient lightening, electricity supply and ventilation. j. Sufficient drinking water and toilets should be available in each examination centre. k. TS-TET Cell may be constituted in the 0/0 the District Educational Officer consisting one Assistant Director, One Superintendent and One Senior Assistant for conducting of Teachers Eligibility Test, to be held on 01.05.2016 and shouldering the responsibility along with the District Educational Officer and also o provide the names and mobile number of the members for information. I. A separate declaration should be taken from the Management of the Institution concerned for constituting that Institution as examination centre. m. The identified centres may have either examination session in the morning (Paper-I) or afternoon (Paper II) session or both sessions. n. District Educational Officer shall personally visit and physically verify the centres and ensure that, all the centres are with the adequate facilities mentioned above and satisfying all the above prescribed norms. To this extent the DEO has to furnish a certificate to this office duly stating that, she / he has visited the centres and has satisfied that the centres have adequate facilities ie., mentioned above and she / he personally satisfied to conduct the Teachers eligibility Test in the centres identified, with at most satisfaction of the department. o. The names of the examination centres with maximum capacity (160 / 240) shall be furnished to this office through ONLINE TRACKING SYSTEM provided to the District Educational Officers.